Published: Jan. 7, 2014 at 06:26 p.m. Updated: Jan. 7, 2014 at 11:43 p.m.
Gary Kubiak isn't ready to ride into the sunset just yet. The former coach of the Houston Texans was in Detroit on Tuesday to interview for the Lions' top job, the team announced. 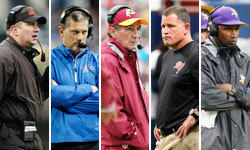 Detroit has spread a wide net in an attempt to find a replacement for Jim Schwartz, but the beeline through the team's flock of serious candidates is clear: Proven experience working with the quarterback position. With Jim Caldwell, Ken Whisenhunt and Jay Gruden in the running, Kubiak -- like those men -- is viewed as an offensive-minded leader who would be brought in to develop Matthew Stafford. At the same time, Kubiak's demise in Houston was linked to a Texans brain trust that tired of a coaching staff that lacked creativity and struggled to make halftime adjustments during a 2-14 campaign. We learned this week that former Tennessee Titans coach Mike Munchak also will interview with the Lions, per NFL Media Insider Ian Rapoport. Put it all together, and Detroit, quite clearly, is opting for an experienced, veteran coach over rolling the dice with a young wild card.